The Practice offers a range of agricultural planning services related to planning: initial advice, business plans, appraisals and preparation and handling of applications and appeals. We can also design your agricultural building or dwelling. We have extensive experience in estate management and replacement dwellings as well as Para 55 houses. How to avoid enforcement action for non-compliance of condition. As the clients had applied for a dwelling in the last ten years, it could not be shown that there had been no agricultural production during this period. However, they were advised to submit a CLU on the basis that they had not been solely or mainly employed in agriculture during this period. This had the benefit that in the event that the CLU failed it would establish the level of agricultural production needed for compliance. However, the evidence gathered by the Practice was sufficient to demonstrate non-compliance with the condition and the certificate was issued. Over the years the Practice has been engaged and retained by a number of clients to advise on planning policy and development issues for buildings and land owned by rural landowners. The following are examples of the work undertaken. The Practice offers specialist planning and policy advice on country houses. 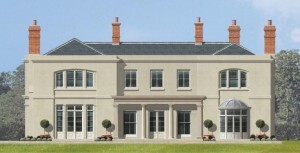 Acting on behalf of Sandy Soames the Practice was successful in obtaining detailed planning permission for a replacement 6 bedroom ‘georgian’ style house with ancillary staff flat and garage on a 4.25ha site at Binley in Basingstoke District. The house was designed by Adam Architecture with landscape assessment and detailed landscaping scheme drawn up by the late Elizabeth Ford Landscape Architect. The site is within the Wessex Downs AONB and contained a collection of 17 former agricultural/ equestrian buildings and two dwellings. Bats were present in one of the dwellings but the scheme included the creation of a bat loft in one of the existing outbuildings to mitigate the effect on bats and make enhanced provision. Although the officer recommendation was for refusal Members of the Planning Committee were persuaded that the development would truly enhance the area and the environment of the AONB and unanimously granted permission.